Anticytokine therapy for periodontal diseases: Where are we now? Periodontal destruction is initiated by bacteria that stimulate host responses leading to excess production of cytokines. Anticytokine therapy for periodontal diseases especially targets proinflammatory cytokines, that is, TNF-α, IL-1, and IL-6, because these are essential for the initiation of the inflammatory immune reaction and are produced for prolonged periods in periodontitis. This therapy aims to bind the cytokines with the receptors present on target cells such as the fibroblasts. The three basic treatment strategies are: (1) neutralization of cytokines, (2) blockage of cytokine receptors, and (3) activation of anti-inflammatory pathways, such as, immune-suppressive pathways. This new therapy can act as a host response modulator in the control of inflammatory diseases of gums and may provide the basis for new molecular therapeutic approaches to the treatment of periodontitis. [TAG:2]Introduction[/TAG:2] Periodontitis is an inflammatory disease fundamentally initiated by chronic bacterial infection. , Current data suggest that a small group of predominantly gram-negative anaerobic or microaerophilic bacteria within the biofilm are often associated with disease initiation and progression. The microbial challenge consisting of antigens, lipopolysaccharides, and other virulence factors stimulates host responses. 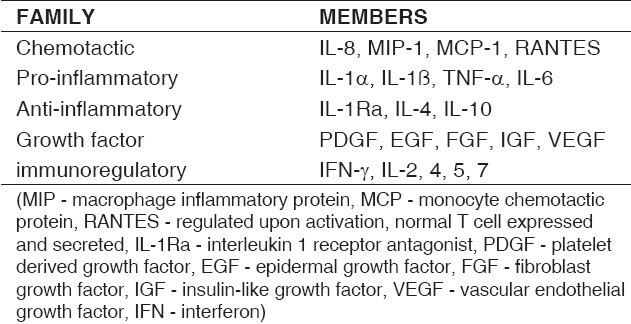 Host reactions to these infecting agents result in the release of inflammatory mediators including proinflammatory cytokines (IL-1, IL-6, TNF-α) and prostaglandins (PGE 2 ), which can promote extracellular matrix destruction in the gingiva and stimulate bone resorption  [Figure 1]. Although these immune and inflammatory host reactions are essential for host defense against bacterial inflammation, excessive and prolonged reaction is harmful for the functional periodontal tissue. Regulation of the immune and inflammatory reaction, in addition to controlling infection in the periodontal tissue, may be one of the methods to prevent and treat periodontal diseases. Therefore, in these instances, the use of the anti-cytokine therapy, in conjunction with anti-biofilm treatments, may prove to be advantageous. Cytokines are a category of signaling proteins and glycoproteins, and are used extensively in cellular communication. Now they are called just Cytokines. Anticytokine therapy for periodontal diseases mainly targets TNF-α, IL-1ß, and IL-6, because they are essential for the initiation of inflammatory immune reactions and are produced for prolonged periods in inflammatory disease. The microbial challenge consisting of antigens, lipopolysaccharides, and other virulence factors, acts as an inducing stimulus. They stimulate cytokine producing cells. Upon stimulation, activation of the cytokine gene occurs and it releases cytokine in the solution. This cytokine binds the receptors present on the target cell. Upon binding, gene activation occurs in the target cell, which releases secondary mediators (i.e., MMPs and PGE 2 ). These mediators are responsible for loss of connective tissue and bone resorption [Figure 2]. Periodontal therapy for periodontal disease aimed at inhibiting the binding of cytokines to receptors is present on target cells such as fibroblasts. Cytokine receptor antagonists bind to the receptor present on the target cell and prevent the cytokine from binding to the target cell. Therefore, there is no activation of the target cell. Example: IL-1 receptor antagonist. (IL-1Ra) Production of IL-1Ra appears to play a role in regulating the intensity of inflammatory responses. Soluble cytokine receptors are derived from the proteolytic cleavage of the extracellular domain of cell-bound cytokine receptors. Soluble receptors can be found in blood and extracellular fluid. Downregulation - Soluble receptors bind to the cytokine in solution and prevent signaling. Transactivation - Soluble receptors bind the cytokine and docks on otherwise non-responsive cells and activate them. [Additional file 3] Out of all these soluble receptors only sIL-6R is an agonist in function, the rest are all antagonist in function and bring about the downregulation of cytokines. It is an interleukin-1 (IL-1) receptor antagonist. It competitively inhibits the binding of IL-1 to the Interleukin-1 type receptor. Anakinra blocks the biological activity of naturally occurring IL-1, including inflammation and cartilage degradation. It is used for the management of signs and symptoms of rheumatoid arthritis. Several studies have been carried out for periodontal diseases and have shown the potential of using IL-1ß and TNF-α antagonists, to reduce tissue destruction in periodontal diseases. ,,, These researchers applied exogenous sIL-1RI and sTNF-RII to the gingival tissues of non-human primates with experimental periodontitis and found inhibition of inflammatory cell infiltration, alveolar bone loss, and loss of tissue attachment. There are certain pharmacological agents with potential host modulation action, but more studies are yet required toward their therapeutic use in treatment of periodontal diseases. Based on these previous studies, Martuscelli et al. carried out a study using recombinant human interleukin-11 (rhIL-11) in the treatment of ligature-induced periodontitis, in dogs. They found a significant reduction in the rate of clinical attachment loss and radiographic bone loss after an eight-week period of rhIL-11 administration, twice a week. Strategies for preventing cell activation seek to inhibit the intracellular transduction of signals produced when ligands bind to their membrane receptors. Signal transduction pathways are mainly activated by cytokines, but also by other factors, such as, bacterial proteins, lipoproteins or environmental stress. Mitogen-activated protein kinase (MAPK) pathway is one of the signal transduction pathways closely involved in inflammation. MAPKs are divided into three families - the extracellular signal-regulated kinases (ERK1/2), c-jun N-terminal kinases (JNKs), and p38. In recent years, the identification of proinflammatory signal transduction pathways has suggested new therapeutic targets. As these are shared by several cytokines, their inhibition will probably prove more powerful than the current treatment strategies. In the experimental arthritis models, p38 inhibitors prevent the development of arthritis and bone erosions. Parasrampuria DA et al. tested RWJ 67657 in human volunteers. After a single dose of RWJ 67657, the serum levels of the proinflammatory cytokines TNF-α, IL-6, and IL-8 were decreased by 90% compared with their plasma peak. To date, no human trials have been initiated with these inhibitors. With JNK, it seems that both isoforms (JNK1 and JNK2) must be inhibited to produce an anti-inflammatory effect. They are compounds that are made by the human body from the omega-3 fatty acids, eicosapentaenoic acid (EPA) and docosahexaenoic acid (DHA). Compounds derived from EPA are designated as Resolvins of the E series (RvE1), and those biosynthesized from DHA are denoted as Resolvins of the D series (RvD). Hasturk et al. showed that, in a rabbit model of human periodontal disease, RvE1 prevents the initiation and progression of tissue destruction. These results support the hypothesis that both EPA- and DHA-derived resolvins have therapeutic potential in resolving periodontal inflammation and restoring the tissues' health. Periodontitis is an inflammatory disease fundamentally initiated by chronic infection. When inflammation is inhibited, the immune system is also downregulated. This increases the risk of microbial infection. The screening of latent infectious diseases, such as tuberculosis, should be performed before using this type of anti-cytokine therapeutic. With antimicrobials, caution must be taken to prevent inapparent infection, without inflammatory symptoms, when anti-cytokine therapy is performed. If anti-cytokine therapy is applied to periodontal treatment, we may use chemical plaque control reagents such as chlorhexidine gluconate in addition to mechanical control. In this era of molecular biology where research has been focused on the genetic level of analysis, treatment should be focused on eliminating the root cause. Periodontal advancement should be diverted toward the use of anti-cytokine therapy in the near future. 1. Listgarten MA. Pathogenesis of periodontitis. J Clin Periodontal 1986;13:418-30. 2. Jotwani R, Cutler CW. Adult periodontitis-specific bacterial infection or chronic inflammation? J Med Microbiol 1998;47:187-8. 3. Suda T, Takahashi N, Udagawa N, Jimi E, Gillespie MT, Martin TJ. Modulation of osteoclast differentiation and function by the new members of the tumour necrosis factor receptor and ligand families. Endocr Rev 1999;20:345-57. 4. Academy report. Modulation of the host response in periodontal therapy. J Periodontol 2002;73:460-70. 5. Arend WP. Physiology of cytokine pathways in rheumatoid arthritis. Arthritis Rheum 2001;45:101-6. 6. Choy EH, Panayi GS. Cytokine pathways and joint inflammation in rheumatoid arthritis. N Engl J Med 2001;344:907-16. 7. Elliott MJ, Feldmann M, Maini RN. TNF-a blockade in rheumatoid arthritis: Rationale, clinical outcomes and mechanisms of action. Int J Immunopharmacol 1995;17:141-5. 8. Wooley PH, Dutcher J, Widmer MB, Gillis S. Influence of a recombinant human soluble tumor necrosis factor receptor FC fusion protein on type II collagen induced arthritis in mice. J Immunol 1993;151:6602-7. 9. Dashash M, Blinkhorn A, Drucker DB, Hutchinson IV, Glenny AM. Interleukin-1 receptor antagonist for treating periodontitis. Cochrane Database Syst Rev 2004 October,Issue 4. 10. Assuma R, Oates T, Cochrn D, Amar S, Graves DT. IL-1 and TNF antagonists inhibit the inflammatory responses and bone loss in experimental periodontitis. J Immunol 1998;160:403-9. 11. Graves DT, Delima AJ, Assuma R, Amar S, Oates T, Cochran D. IL-1 TNF antagonists inhibit the progression of inflammatory cell infiltration toward alveolar bone in experimental periodontitis. J Periodontal 198;69:1419-25. 12. Chiang CY, Ktritsis G, Graves DT, Amar S. IL-1 and TNF activities partially account for calvarial bone resorption induced by local injection of lipopolysaccharide. Infect Immune 1999;67:4231-6. 13. Delima AJ, Oates T, Assuma R, Schwartz Z, Cochran D, Amar S, et al. Soluble antagonist to IL-1 and TNF inhibits loss of tissue attachment in experimental periodontitis. J Clin Periodontal 2001;28:233-40. 14. Trepicchio WL, Bozza M, Pedneault G, Dorner AJ. Recombinant human IL-11 attenuates the inflammatory response through down regulation of proinflammatory cytokine release and nitric oxide production. J Immunol 1996;157:3627-34. 15. Leng SX, Elias JA. Interleukin 11 inhibits macrophage IL-12 production. J Immunol 1997;159:2161-8. 16. Martuscelli G, Fiorellini JP, Crohin CC, Howell TH. The effect of IL-11 on the progression of ligature induced periodontal disease in the beagle dog. J Periodontal 2000;71:573-8. 17. Adams JL, Badger AM, Kumar S, Lee JC. p38 MAP kinase: Molecular target for the inhibition of proinflammatory cytokines. Prog Med Chem 2001;38:1-60. 18. Parasrampuria DA, de Boer P, Desai-Krieger D, Chow AT, Jones CR. Single-dose pharmacokinetics and pharmacodynamics of RWJ 67657: A specific p38 mitogen-activated protein kinase inhibitor: A first-in-human study. J Clin Pharmacol 2003;43:406-13. 19. Kirkwood KL, Li F, Rogers JE, Otremba J, Coatney DD, Krieder JM, et al. A p38 alpha selective mitogen activated protein kinase inhibitor prevents periodontal bone loss. J Pharmacol Exp Ther 2007: in press. 20. Han Z, Boyle DL, Chang L, Bennet B, Karin M, Yang L, et al. c-jun N-Terminal kinase is required for metalloproteinase expression and joint destruction in inflammatory arthritis. J Clin Invest 2001;108:73-81. 21. Hasturk H, Kantarci A, Goguet-Surmenian E, Blackwood A, Andry C, Serhan CN, et al. Resolvin E1 regulates inflammation at the cellular and tissue level and restores tissue homeostasis in vivo. J Immunol 2007;179:7021-9. 22. Bannenberg GL, Chiang N, Ariel A, Arita M, Tjonahen E, Gotlinger KH, et al. Molecular circuits of resolution: Formation and actions of resolvins and protectins. J Immunol 2005;174:4345-55. 23. Schwab JM, Chiang N, Arita M, Serhan CN. Resolvin E1 and protectin D1 activate inflammation-resolution programmes. Nature 2007;447:869-74. 24. Hasturk H, Kantarci A, Ohira T, Arita M, Ebrahimi N, Chiang N, et al. RvE1 protects from local inflammation and osteoclast-mediated bone destruction in periodontitis. FASEB J 2006;20:401-3. 25. Keane J, Gershon S, Wise RP, Mirabile-Levens E, Kasznica J, Schwieterman WD, et al. Tuberculosis associated with Infliximab: A TNF-a neutralizing agent. N Engl J Med 2001;345:1098-104.